Since I first laid eyes on a test tube spice rack, I’ve had an slightly nutty obsession with having one. I believe it was in high school when I first saw them, and they seemed soooo expensive back then. And even then I understood how impractical the they were — at most they held 40 spices, and the tubes were tiny. So as I moved into my own place, graduated college, started making my own money and could actually afford one of these spice racks (plus, they didn’t seem quite so expensive later in life), I still refrained from purchasing one due to those drawbacks. 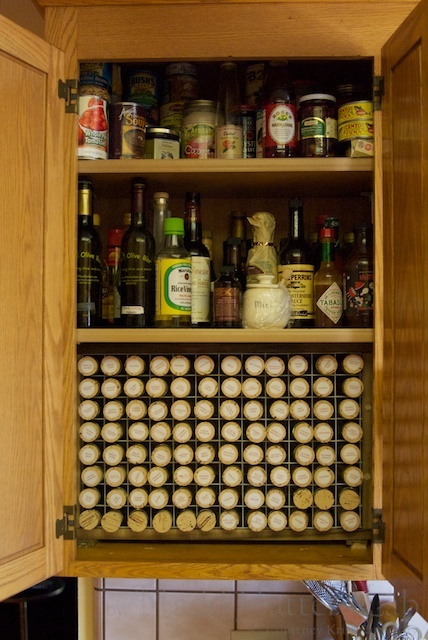 After we had lived in our house for a while, I started revisiting the idea of having a test tube spice rack. For one, my spice shelf was a mess, and I had an overflow bucket of spices above the stove. Second, after having a house, I’ve come to realize how many different items you can track down on the internet these days for purchase. Large test tubes? Not a problem! A rack for 100 of these? Well, that posed a bit more of a problem, as such a thing didn’t seem to exist. One thing I still haven’t learned, though I realize it every time I start to siphon an item into a bottle, is that spices, flours, sugars, all the items in powdered form that fill our kitchen pantries, are more compacted in their packaging than they will be when I siphon them into a jar or test tube. So at first I was flummoxed by the fact that my spices, which should have had extra room in the test tubes, were overflowing. Then I figured out by shaking or tapping the tube a bit that I could get the powder to settle in a bit, and almost all of my spices then easily fit into their tubes. 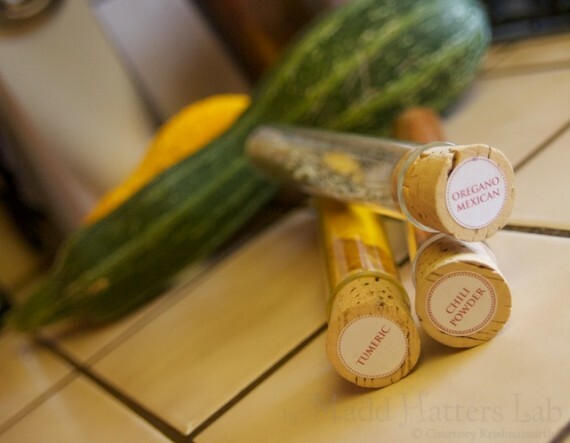 Test tubes filled, I added a 1-inch round sticker to the top of the cork, marking what spice filled the tube. I had printed these out earlier, using a Martha Stewart initial template, with the initial removed and the spice name added. Then there was the trial and error of creating a rack to fit 100 test tubes in. 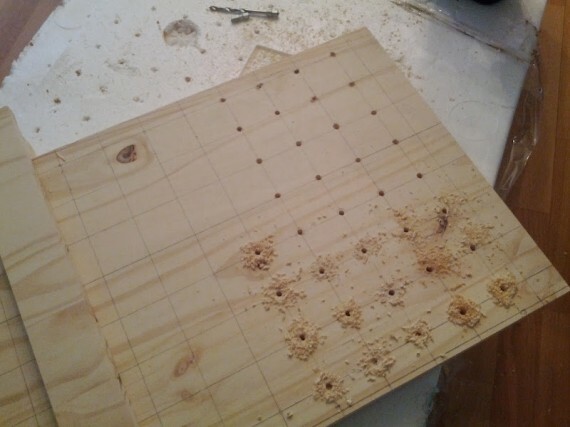 Initially, my idea was to create two boards with 1 1/2 inch holes drilled in, connecting them with dowel rods. When I started taking measurements, I realized in order for this to work and not take up my entire cabinet, I would need to keep the width between the holes down to 1/8 of an inch. “No problem!” I thought. Ha! A machine may be up to such accuracy, but the Madd Hatter is not. I initially drilled pilot holes to help guide the larger drill bit. When I got to the larger drill bit, I ended up with a couple of clover shapes where my guide hole were off by fractions of an inch. So it was back to the drawing board on the spice rack. My next idea was to find something already in a grid formation. Initially I was thinking chicken wire, but unfortunately the holes weren’t large enough to accomodate the large test tubes. I wandered up and down the aisles of Home Depot, looking at larger metal tubes that could be welded together, or fencing, which had holes larger than what I needed. I was about to give up when I came across this ClosetMaid drawer. Excited, I grabbed a tape measure from a nearby employee. Yes! 1 1/2 inches exactly between the wire. And just enough spaces for me to fit 96 tubes (I had previously decided on a 12 x 8 layout to best fit in my cabinet. Plus, I had broken 2 test tubes, so this left me with 2 extras.) if I could bend the curve of the drawer flat. This could work! I finished picking up supplies – 2 of the ClosetMaid drawers, 3/4-inch square dowel rod to create a frame to hold the grid and cutting discs for my Dremel. 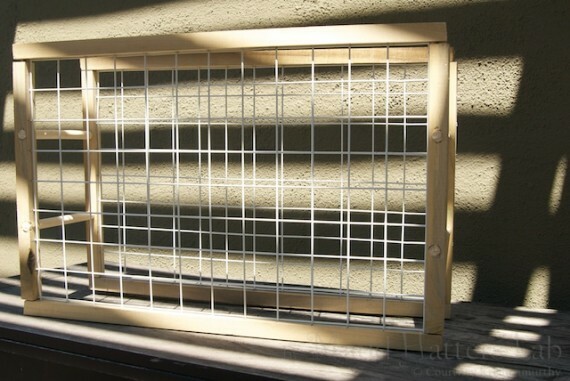 I already had the round dowel rods to connect the two frames from my previous attempt at creating a rack. 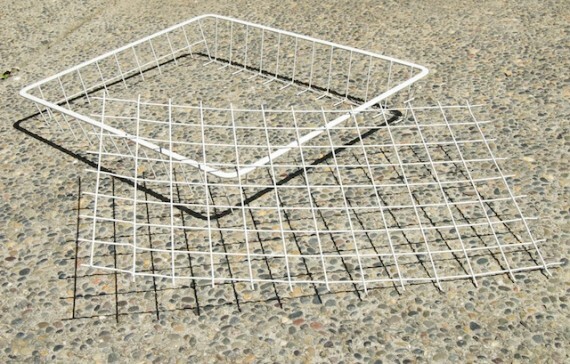 Once home I went to work on dismantling the drawers, cutting the grids away from the drawer, and using a hammer and paper towels to straighten the wire against the concrete patio. The result was a fairly straight piece of grid, which would become straighter once I inserted it into the dowel rods. I had left nubs on the outside of the grid I cut, and I measured by sight where the nubs should plug into the dowel rod. Then I drew a center line down the length of the dowel rod to ensure the nubs were centered and the grid would be as close to straight as possible. 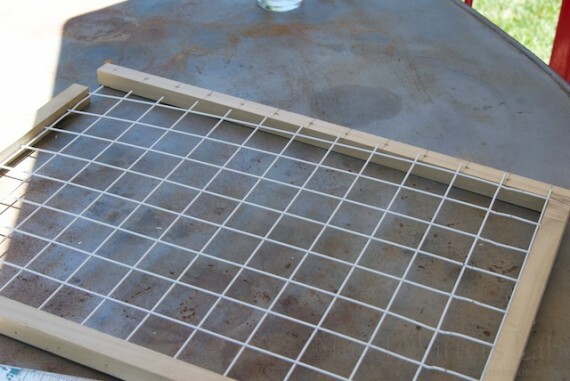 Using a drill bit the same size as the grid’s wire, I drilled the holes then inserted the grid into them. This was hard going at first, as the grid kept popping out as some nubs were lined up and others weren’t, but then I figured out using a pair of pliers to help fully push the nubs into the hole was the way to go, and the process went more quickly. Once the grid was framed with all 4 dowel rods, I used a screw through the top into the side dowel rods to hold everything together. 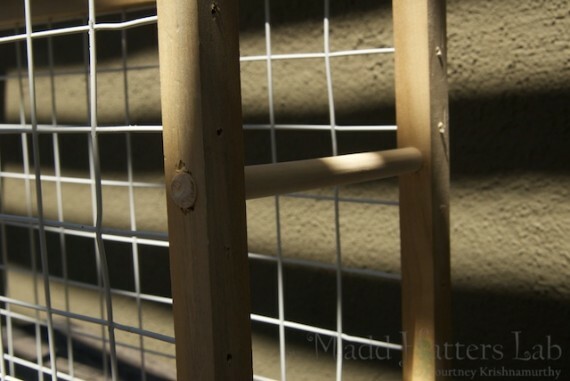 Then I attached the two frames and grids with the shorter dowel rods I had from my previous attempt at the rack. Ta-da! A rack that looks like it was built in a middle school shop class! If this was going out on a counter I probably would have worked harder to ensure that everything was lined up perfect, and in hindsight, I wish it was level. However, this is going in my cabinet, so I’m not too worried about the looks so long as it’s sturdy and it functions. And it did! I managed to get the rack into the cabinet, adjusting the height of the other shelves a bit (which I knew I would have to do in advance). I used shims to level the rack and give it a slight angle toward the back. 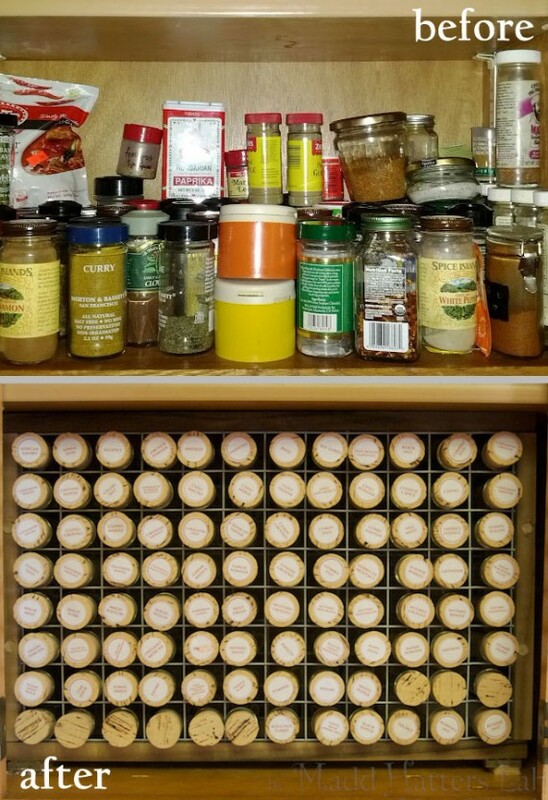 When I get around to redoing the kitchen, I may create a frame that lays over the front and a more permanent shim, but for now, this works, and I have a super-organized spice rack with room for 9 more spices! Once everything was back in the cabinet, I wanted to just lounge about in the kitchen and look at this spice rack that had been months (years, even!) in the making! Not cheap, but perfectly built to suit my needs. 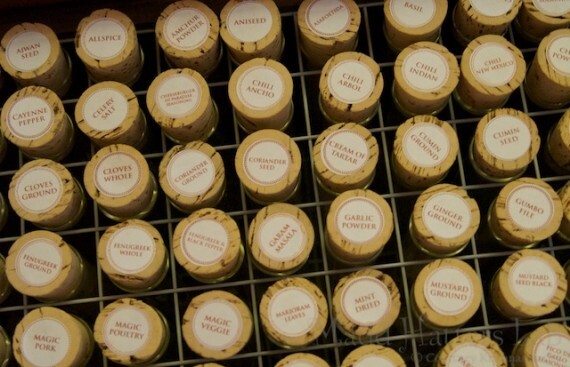 While Dean & Deluca’s test tube racks come with spices, to get nearly the same amount of spice tubes would cost me $435. Their site doesn’t say how much each tube holds, but I seem to remember these being smaller test tubes (from seeing it in the store once upon a time), which means you would have to store your leftover spice that didn’t fit in the tube somewhere. So I’m glad I went the DIY route! I just love this!! But the test tube link didn’t work, So I copied the URL and went to look for LCM labs and found them! But I don’t know if you got the plane or rimmed test tubes and I can’t seem to find the 32 mm size ? So off I am to research that size because as I said, I JUST LOVE THIS! Thanks for generously sharing your idea!!!! The ones I have are rimmed, which is helpful to keep the tube from sliding past the grate I have holding them, but I don’t think it is necessary, especially if they are in the cabinet and recessed to where the tubes press against the back wall. As you can see, I had a lot of trial and error in my project, but I do still very much love the result! I hope the overview helps you sidestep a few of my missteps!